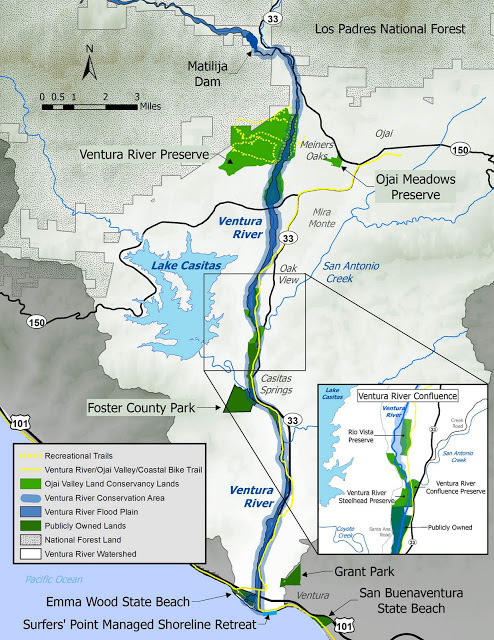 A Ventura River Parkway map illustrates the importance of ecosystem-based management by showing the connections within the watershed, all the way down to the beach. The Surfrider Foundation Ventura County Chapter acknowledges the interconnectedness of all things. Ecosystem-based management (EBM) is a term that describes responsible care for natural resources and urban environments that takes into account the connections between physical, biological, and social processes. Healthy beaches and oceans depend on healthy watersheds. Public knowledge depends on public access. It is for this reason that the chapter advocates for pollution prevention and science-based natural resource management inland and upstream. Three campaigns focused on the Ventura River Watershed illustrate these principles well; maximum success for each one can only be achieved through success for all. See this article from the Surfrider Foundation’s publication Making Waves for a thorough explanation of what it means to use ecosystem-based management to protect our oceans, waves, and beaches.